In this post we describe a silicon photodiode coupled to a CsI(Tl) scintillator used as radiation detector. 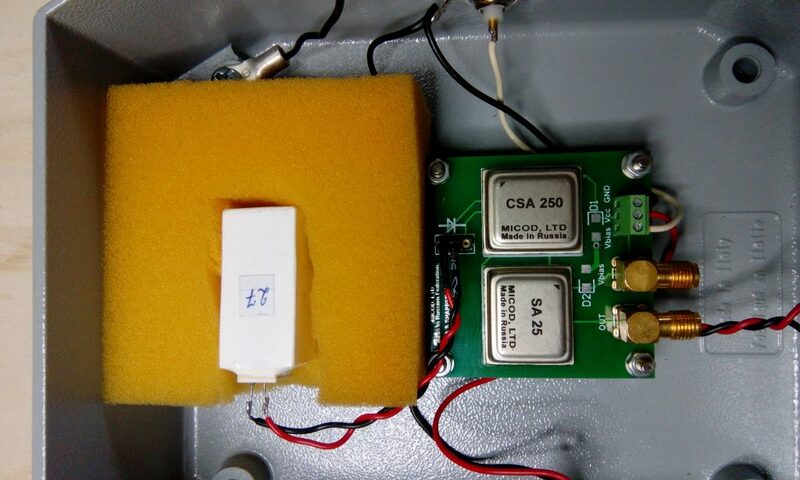 This application is well known and we have covered a similar field in this post : Si-PIN Photodiode with Micod CSA-SA, now we would like to test the apparatus built by Micod (a Russian company, that we thank) also with a scintillator. 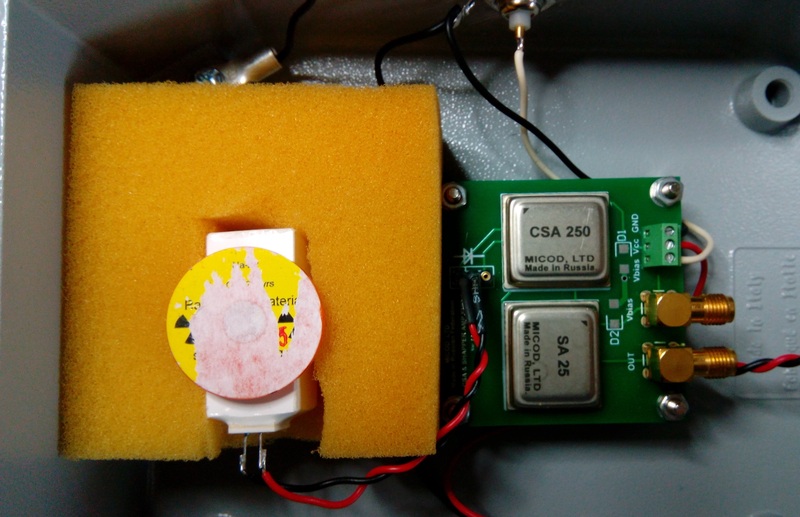 In the cover image you can see the “kit” composed by a CsI(Tl) scintillator coupled to a photodiode and the evaluation board with a CSA (charge sensitive amplifier) and an SA (shaping amplifier). A photodiode can be used as a radiation detector in two ways : directly or coupled with a scintillator crystal. When it is used directly it is efficient in the low-energy part of the spectrum, until 50-60 KeV. In this range it has a potentially high energy resolution. With a scintillator it can instead cover the whole gamma spectrum and mainly the high-energy range. 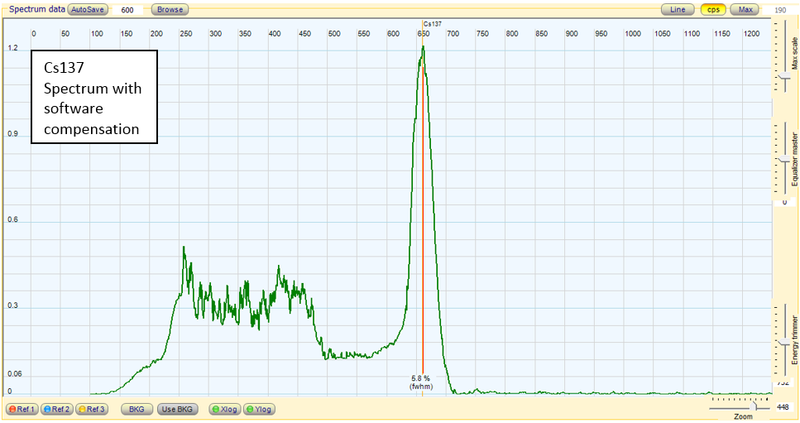 In this post we describe the tests we did with a photodiode coupled to a CsI(Tl) scintillator. The image below shows the scintillator crystal, covered with high-reflecting white varnish, coupled to a silicon photodiode. The most important feature of Cesium Iodide crystals doped with Thallium CsI(Tl) is their emission spectrum having the maximum at 550 nm, which allows photodiodes or SiPMs to be used to detect the emission. The use of a scintillator-photodiode pair makes it possible to diminish significantly the size of the detecting system (due to the use of photodiode instead of PMT), to do without high-voltage supply source, and to use detecting systems in magnetic fields. The high radiation resistance (up to 102 Gy) allows CsI(TI) to be used in nuclear, medium and high-energy physics. 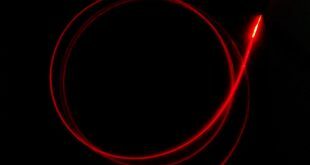 Special treatment ensures obtaining of CsI(TI) scintillators with a low afterglow (less than 0.1% after 5 ms) for the use in tomographic systems. To measure the current pulse produced by the photodiode it is necessary to have an “amplifier chain” composed by a charge sensitive amplifier (CSA) followed by a shaping amplifier (SA). The matching between the detector and preamplifier defines the low noise of the spectroscopy system, therefore for these applications the best noise performance of the associated preamplifier is required. Generally, a field effect transistor, FET, is used as the input device. The charge sensitive preamplifier uses a feedback capacitor Cf and, in this case, a feedback resistor Rf. The feedback capacitor is charged by the injected signal from the detector and discharged immediately through the feedback resistor. A drawback of the feedback resistor is that it is an additional source of noise. After the CSA it is necessary to send the signal to a shaper amplifier (SA) which processes the pulse to amplify it and reshape it to obtain a quasi-Gauss shaped output signals. The shaper amplifier enhances essentially the signal-to-noise ratio and enables the signal to be sent to a counting device or to an analog-to-digital converter to acquire a spectrum. The Micod SA has a shaping time of about 10 μs. With the setup described above, we did some measurement tests of some sample sources (Am241, Na22, Cs137 and others). We placed the source directly on the scintillator crystal and connected the shaper output to our pulse counter (described in the post PSoC based Pulse Counter). The counting threshold has been configured to 80 – 100 mV, so as to exclude the pulses due to noise. The images below show some sources put on the crystal to perform the measurement. In the image below you can see traces of some impulses generated by the photodiode and subsequently amplified by the CSA (charge sensitive amplifier) ​​and the SA (shaping amplifier). The pulse duration is about 15 μs, while the amplitude varies (depending on the energy of the radiation) from 200 mv to over 1000 mv. Superimposed on the signal there is a background ripple (due to the noise of the photodiode, amplified by the chain) having an amplitude of about 50 mV. With the CsI(Tl) scintillator coupled to the photodiode we made the measurements of the activity of the sample sources and we compared the data with those obtained, under similar conditions, with a scintillation sensor NaI (Tl) 63×63 mm coupled to a PMT. The results are shown in the table below. In reading these data we must take into account that the PD plus scintillator is sensitive even to the β particles, while the PMT scintillation sensor is coated with an aluminum layer that stops them. 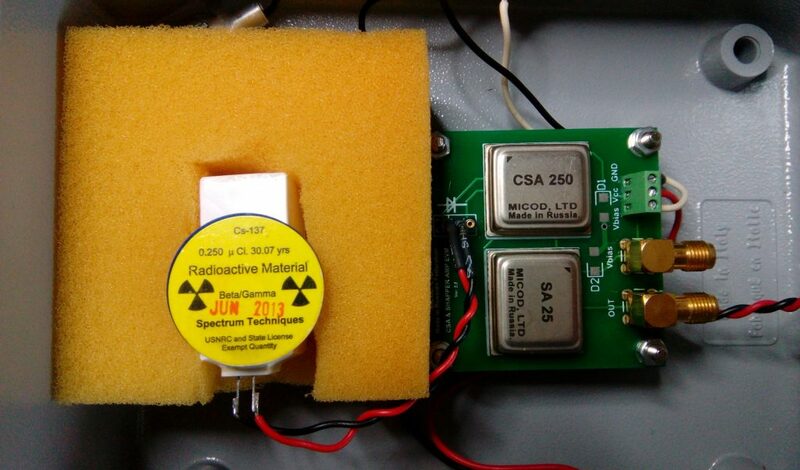 Both the source of Cesium 137 and the Sodium 22 emit, with different intensities, β particles (electrons the Cesium and positrons sodium), the photodiode countings therefore also includes a share of β radiation which is practically absent in the measurements made with the PMT scintillator. 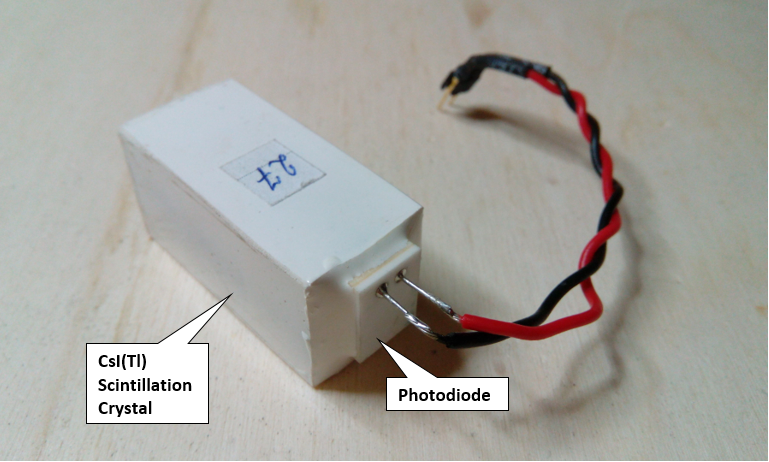 Even taking into account the contribution of β radiation, we can see how the photodiode with CsI(Tl) used as a gamma detector, included in the amplification chain with the pulse counter, is absolutely comparable to that obtained with a classic PMT scintillation detector. With the pulses produced by the shaping amplifier we tried to acquire the gamma spectra of two gamma sources using the Theremino MCA (DIY Gamma Spectrometry). The pulse produced by the shaping has a duration of around 15μs, rather short for the audio ADC which works better with pulses of around 100μs. In this paragraph we report the results obtained for the sample sources Cs137 and Na22. 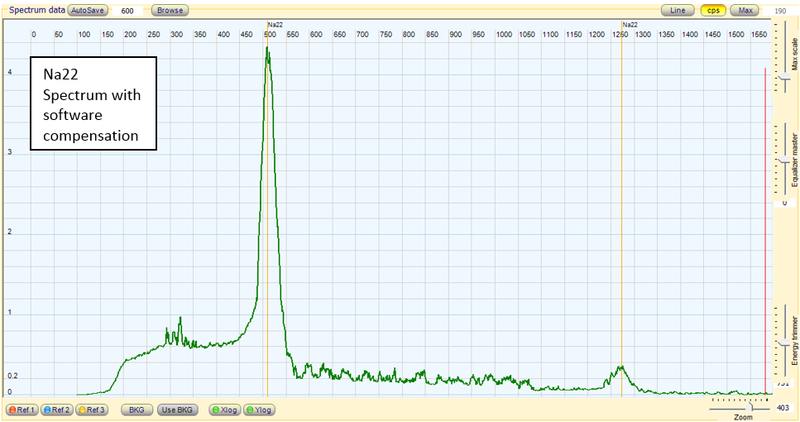 The fist chart below shows the gamma spectrum of Cs137. 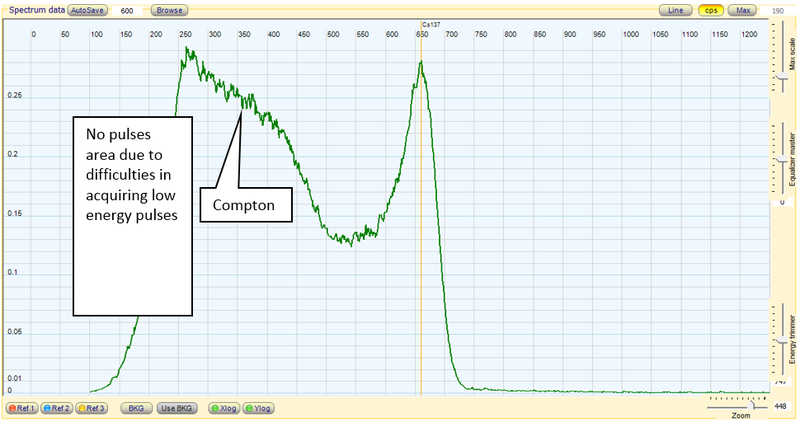 The main peak and the compton continuum are evident, the low-energy part of the spectrum does not show any trace because of the difficulty to acquire, with our MCA, low amplitude pulses. Theremino MCA has the possibility to partially compensate the peak broadening, so in the second chart we show the Cs137 “compensated” spectrum, while the third chart shows the Na22 spectrum: in both cases the peaks are well defined and the resolution is pretty good.